Anne Francis | 50 Westerns From The 50s. 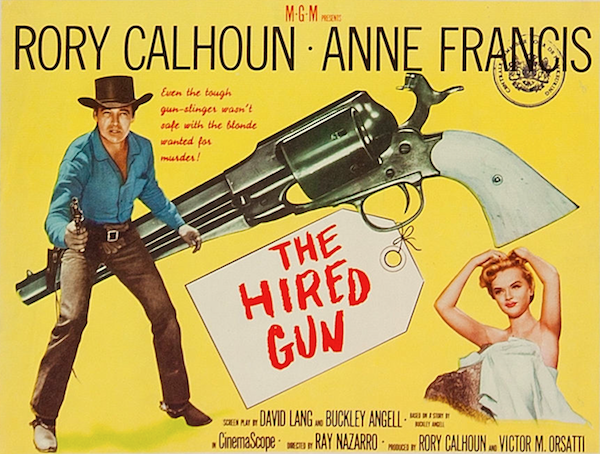 DVD Review: The Hired Gun (1957). Around the time I decided to write a book on 50s Westerns, and long before I’d thought about a blog to go with it, The Hired Gun (1957) was a movie sitting near the top of my Want List. Rory Calhoun. Anne Francis. Vince Edwards. Guinn “Big Boy” Williams. Black and white CinemaScope (an aesthetic I adore). Directed by Ray Nazarro at Lone Pine. How could this thing not be terrific? But what were my chances of ever seeing it widescreen as intended? Dissolve to: six years later. An anamorphic widescreen DVD of The Hired Gun was released by Warner Archive a couple weeks ago. And now that I’ve had a chance to see it in all its monochromatic 2.35:1 glory, what’s the verdict? To be honest, The Hired Gun seems like pretty standard stuff. Plot-wise, it’s nothing that couldn’t be covered in an hour-long TV show. 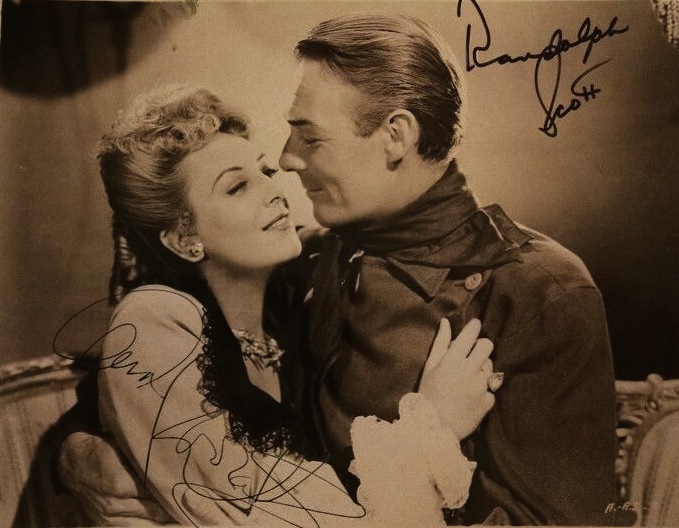 But like so many of the lower-budgeted Westerns of the 50s, the people involved, and what they bring to these minor films, make all the difference. 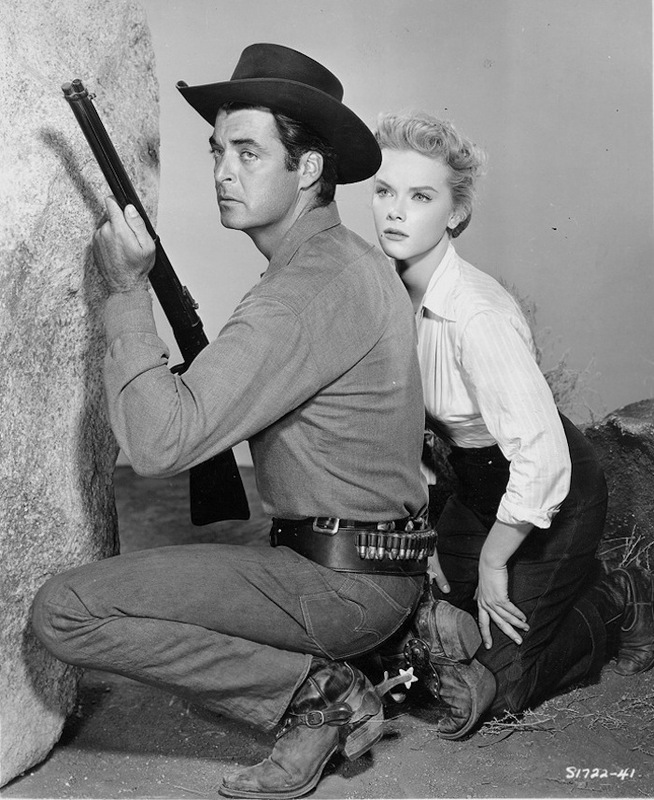 The Hired Gun was produced by Rory Calhoun and his agent, Victor Orsatti. 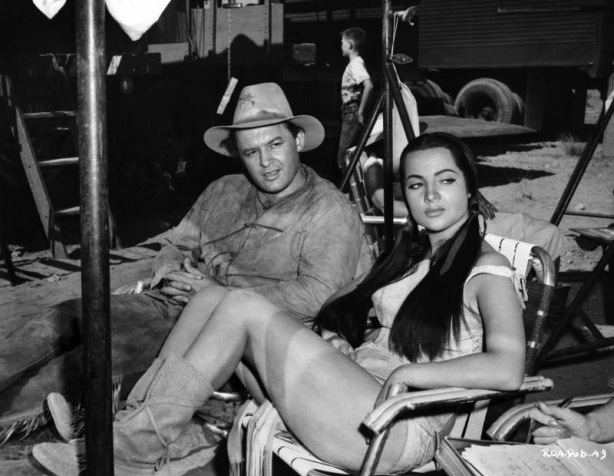 Their Rorvic Productions made a handful of films in the late 50s, along with Calhoun’s TV series The Texan; the three Westerns were directed by Ray Nazarro (his other two Rorvic pictures were The Domino Kid and Apache Territory). With The Hired Gun set for MGM release, Anne Francis, who’d just appeared in MGM’s Forbidden Planet (1956) and was a rising star at the studio, was signed as Calhoun’s co-star. Francis is Ellen Beldon, who’s to be hung for the murder of her husband. She’s sprung from jail by Chuck Connors, who works on her uncle’s ranch. Very quickly, Mace Beldon (John Litel), the dead man’s father, hires gunslinger Gil McCord (Calhoun) to track her down. 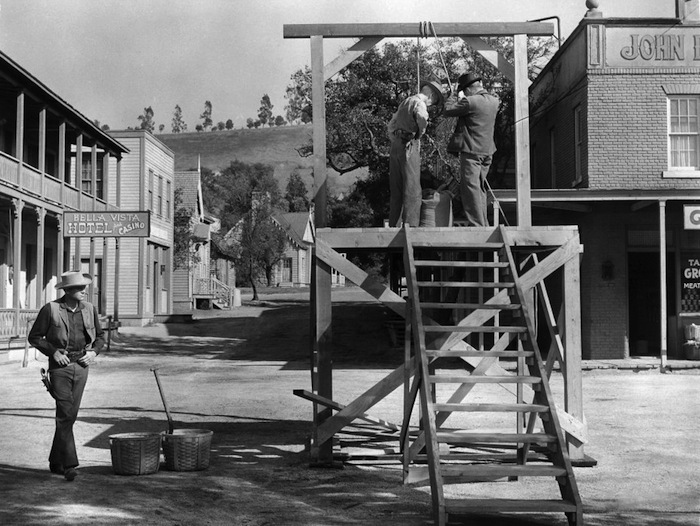 The jailbreak, and the chase that follows it, are really well staged — Ray Nazarro was so good with action. Here, he uses an under-cranked camera to boost the urgency and pacing. The rest of the picture, taken up by Calhoun capturing Francis and their journey together, covers more familiar territory. But it covers that territory well, thanks to the professionalism and craft of those who made it. 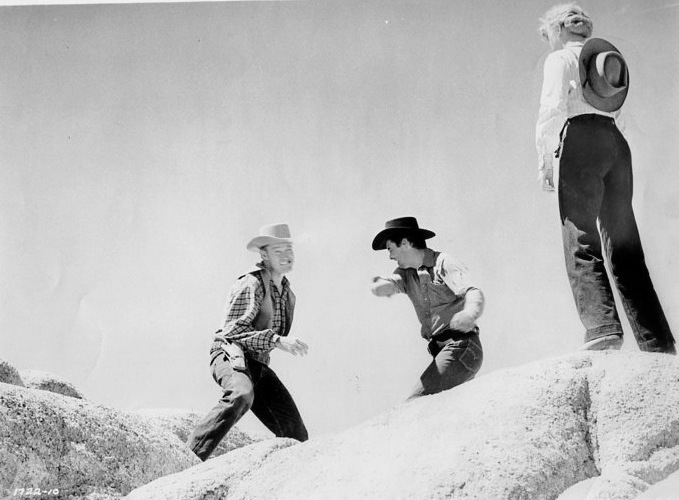 Calhoun is cool as a cucumber as the gunman, whether he’s posing as a ranch hand, beating the crap outta Chuck Connors or talking tough to Anne Francis. Since the film’s so short, just 64 minutes, there’s not a lot of time for real character development. We assume all along that he’ll change his mind about his prisoner before it’s all over with. So, everyone on the picture was fully expecting to see the young actress suffer while in Lone Pine. She was determined to deny them that satisfaction. 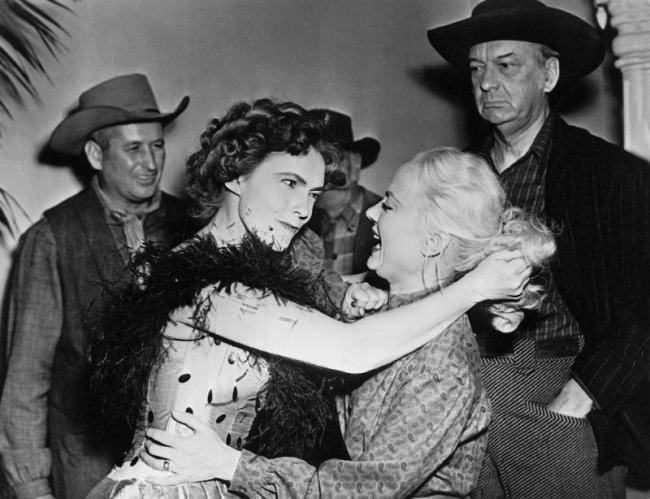 Oh, and if you look quick, you’ll see Buelah Archuletta, who played “Look” in The Searchers (1956). Director of photography Harold J. Marzorati captures Lone Pine, with snow-covered mountaintops in the distance, in stunning black and white CinemaScope. 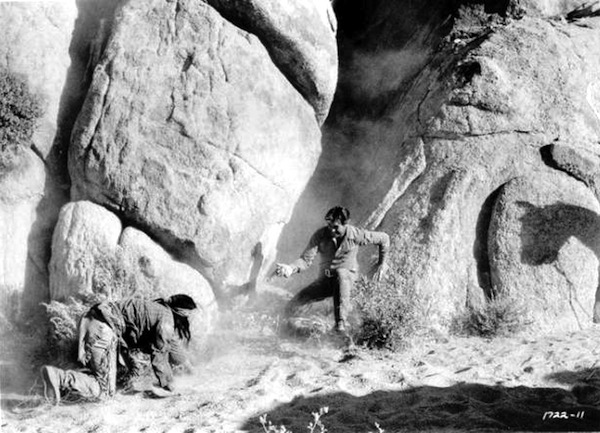 Lone Pine always looks terrific in black and white — check out a Tim Holt picture or two for further proof — and the wide frame makes it all the more dramatic. Marzorati’s gorgeous work was done a real service by the folks at Warner Archive. His ‘Scope compositions are perfectly presented and the contrast levels are just right. When was the last time someone saw this movie looking like this? There’s a “textless” trailer to round out the package. Someone recently commented here that “we’re living in a Golden Age for classic movie lovers.” And when an anamorphic widescreen DVD of a cheap little Western like The Hired Gun can be yours for a little e-commerce, I have to agree. Laura posted a review of The Hired Gun over at her place today, too.